Small volumes of RPS10 recombinant protein vial(s) may occasionally become entrapped in the seal of the product vial during shipment and storage. If necessary, briefly centrifuge the vial on a tabletop centrifuge to dislodge any liquid in the container`s cap. Certain products may require to ship with dry ice and additional dry ice fee may apply. Component of the 40S ribosomal subunit. NCBI/Uniprot data below describe general gene information for RPS10. It may not necessarily be applicable to this product. RPS10: a ribosomal protein of the S10E family. Located in the cytoplasm and nucleus. Ribosomes, the organelles that catalyze protein synthesis, consist of a small 40S subunit and a large 60S subunit. Together these subunits are composed of 4 RNA species and approximately 80 structurally distinct proteins. 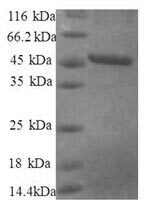 This protein is a component of the 40S subunit. 1. These results are consistent with a model in which the Nef protein by binding to two components of the 40S small ribosomal subunit, RPS10 and 18S rRNA, and to a lesser extent to tRNAs, could lead to decreased protein synthesis.